Woodland Croquet by AM LEG A/S at Scruffs Game. MPN: 867207. Hurry! Limited time offer. Offer valid only while supplies last. Play croquet the Woodland way! Whimsical wooden wickets, mallets, and balls make this classic game a refreshing and fun pastime for the whole family. Play croquet the Woodland way! Whimsical wooden wickets, mallets, and balls make this classic game a refreshing and fun pastime for the whole family. 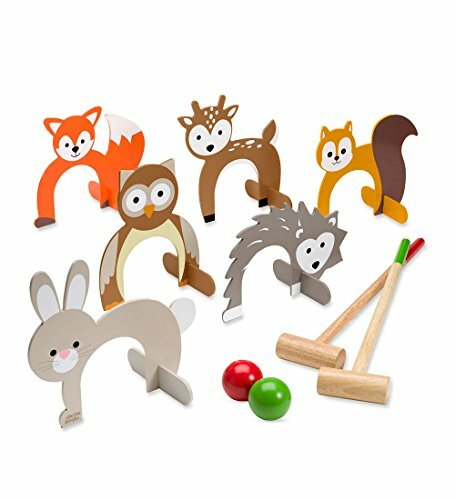 Our croquet set is transformed from ordinary to game-night-worthy with the sweet faces of kids' favorite critters. Hit the ball through a deer, a fox, a rabbit, and more to win it all! This all-wood set includes six wickets, two mallets, and two balls. For ages 5 and up. If you have any questions about this product by AM LEG A/S, contact us by completing and submitting the form below. If you are looking for a specif part number, please include it with your message.